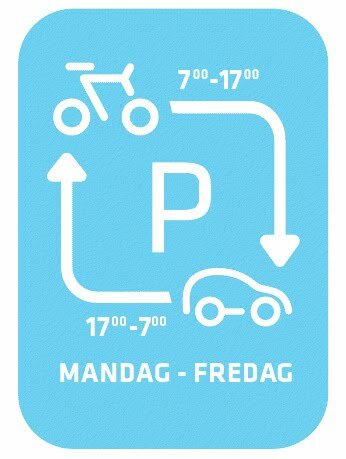 The City of Copenhagen in collaboration with Atkins Denmark have started testing Flex Parking zones in Copenhagen. Starting with the street outside Ingrid Jespersen's High School in Ndr. Frihavnsgade (that's a street name). We recieved info about the project from Niels Hoe-Svendsen from Atkins, formally in charge of the City of Copenhagen's bicycle parking. The primary goal is to create a safe environment for cycling to school. Many schools built at the turn of the last century in Copenhagen have space problems regarding bicycle parking in the school yards or on the street. Thus this new pilot project called Flex Parking. Instead of removing car parking spots and turning them into bicycle racks, the idea is to exploit the city space as best as possible by reserving the space for cyclists only when they actually use it. No bicycle racks will be implemented in order to easily make the switch from bicycle to car parking. Everyone has a kickstand anyway - readers may recall the Bicycle Parking Zones project in Copenhagen a couple of years ago - so that's hardly an issue. Cyclists are asked to move their bicycles before 17:00 and motorists are asked to move their cars before 07:00. Cars are not allowed to stop in the zone either, in order to allow bicycles to park in the morning before school. The City, as it does with many projects, lets citizens text their opinion about the pilot project. If you're in Copenhagen and wish to comment about it, text the word Parkering and your comment to 1220. The project is in conjunction with the Ctiy of Copenhagen's Safe Routes to School initative. - Artistic Parking Zones in the Netherlands.